Cardiac surgeons at the National Institute of Cardiovascular Diseases (NICVD) on Monday the 09th July 2018 announced a successful implant of a mechanical pump known as Left Ventricular Assist Device (LVAD) in the chest of a female patient whose heart was not functioning properly and required mechanical support to pump blood in her body. NICVD Karachi First Mechanical Heart Implantation. NICVD Karachi First Mechanical Heart Implantation. It is a milestone in Pakistan’s medical history, as the use of this technology is unprecedented in Pakistan’s history. 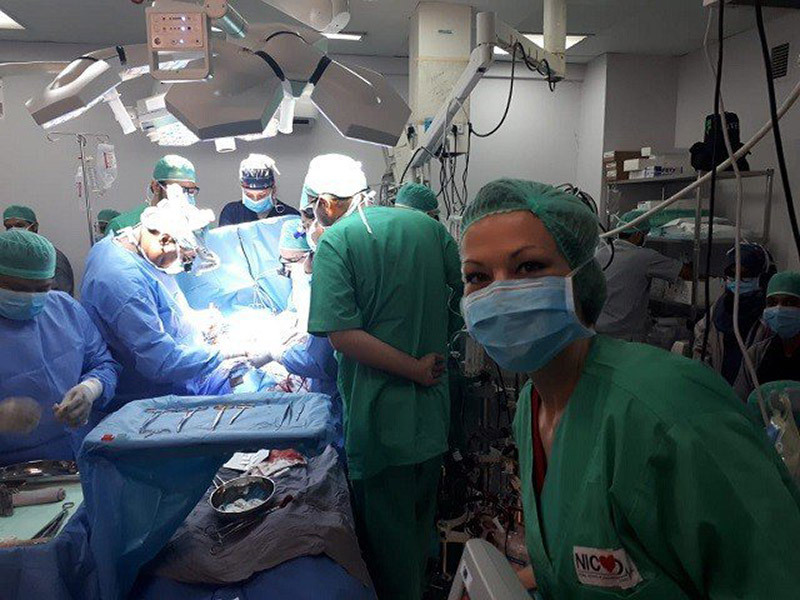 NICVD Karachi First Mechanical Heart Implantation.Nafeesa Begum, 62 years old cardiac patient is the first patient in the country to undergo this surgery and receive a mechanical heart transplant. NICVD Karachi First Mechanical Heart Implantation. 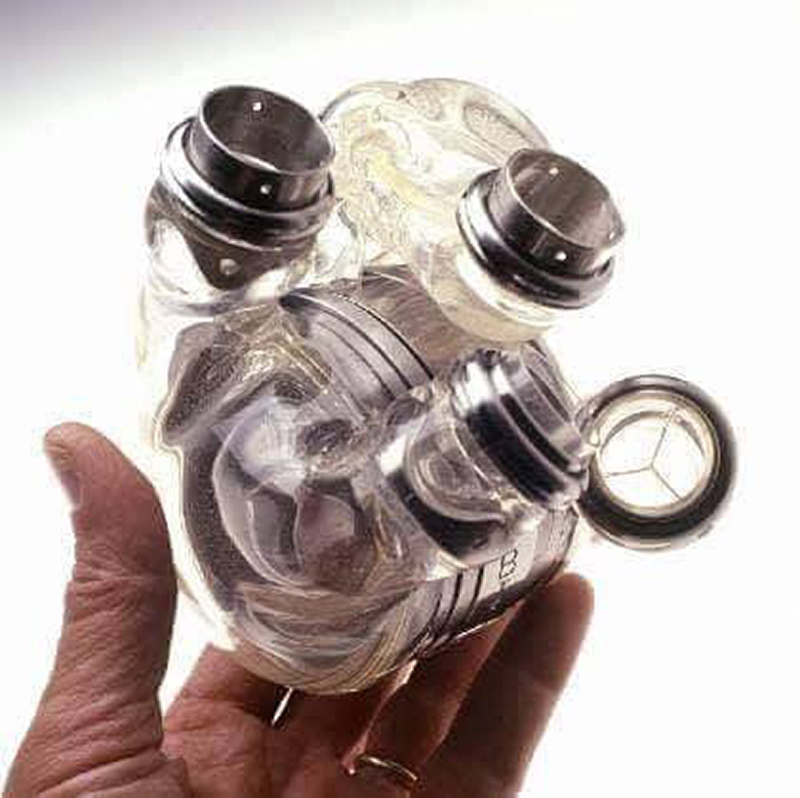 “Left Ventricular Assist Device (LVAD) is just a supportive device that helps the pumping of blood from the left ventricle of a patient whose heart’s left ventricle becomes weak, while it does not replace the heart of the patient with the mechanical device”. NICVD Karachi First Mechanical Heart Implantation.But Executive Director NICVD Prof Nadeem Qamar and transplant surgeon Dr Pervaiz Chaudhry, who has returned from the United States and led Monday’s implant surgery, insisted that they had “inserted” an artificial heart in the chest of the elderly female patient, who was doing fine after the surgery and would be able to breathe without support and talk to her family from yesterday (Tuesday) the 10th July 2018. NICVD Karachi First Mechanical Heart Implantation. Caretaker Sindh health minister Dr Sadia Rizvi, Prof Nadeem Rizvi and Dr Pervaiz Chaudhry were also present on the occasion. NICVD Karachi First Mechanical Heart Implantation. Talking about the first LVAD implant at the NICVD, Prof Qamar vowed that their ultimate goal was achieving the target of heart transplants, saying that within next one or two years, heart transplants would be performed at the NICVD. NICVD Karachi First Mechanical Heart Implantation. 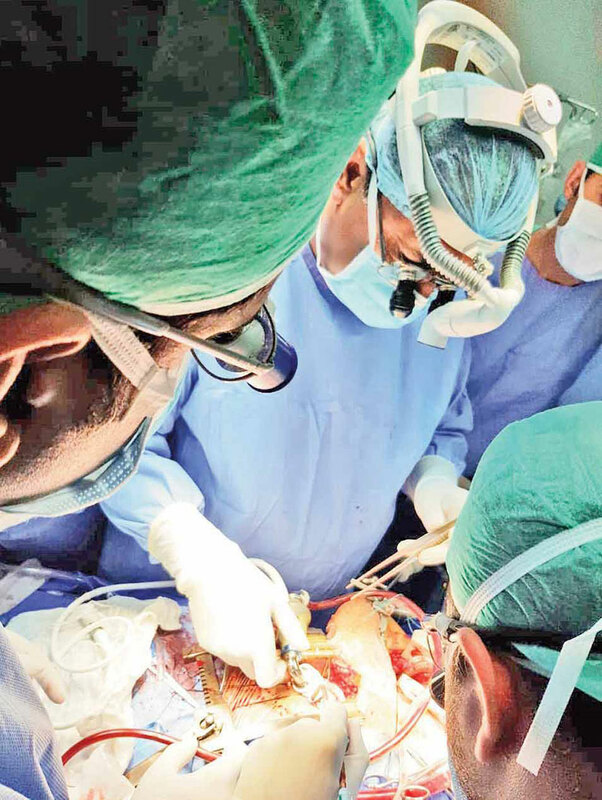 To a query, he said an LVAD implant costs around 11-12 million, but not a single penny was received from the attendants of the patient for this complicated and costly surgery. The NICVD had identified former hockey goalkeeper Mansoor Ahmed as the first patient to receive the LVAD, but he died before the surgery could be performed on him. 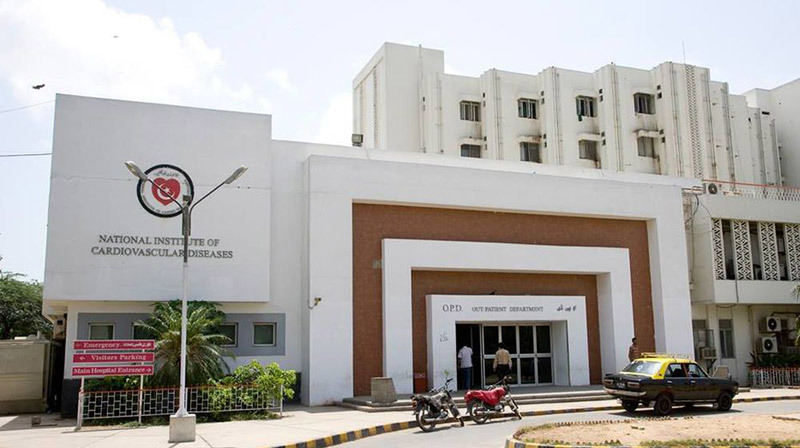 Prof Qamar said that except for an American nurse, Abigail Boultinghouse, all the surgeons, doctors, postgraduate students, nurses and technicians were Pakistanis who would learn a lot from these surgeries, while the US nurse would train local nurses in dealing with these patients after surgeries. 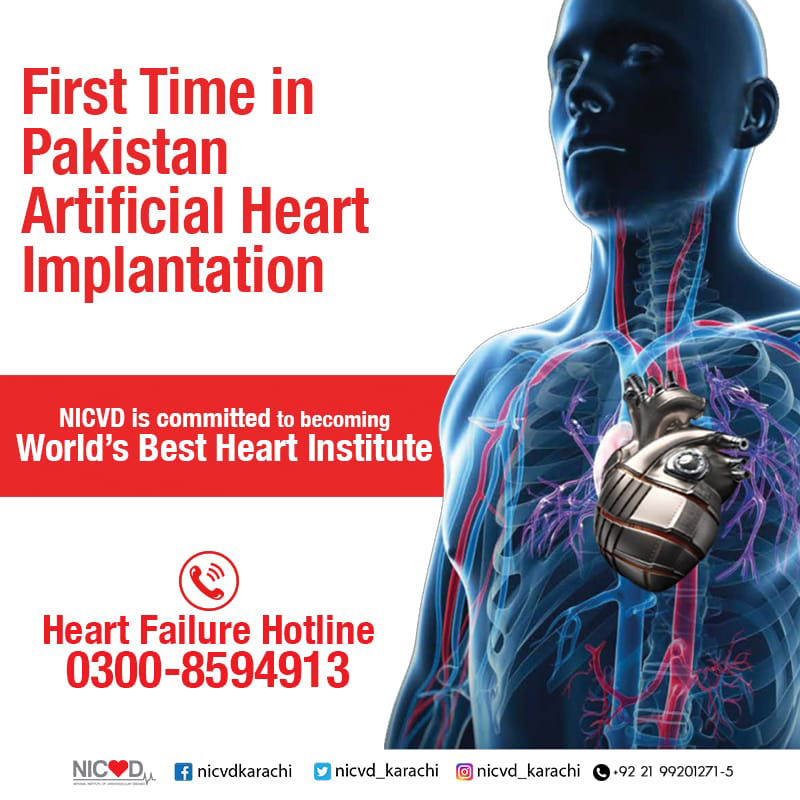 NICVD Karachi First Mechanical Heart Implantation.